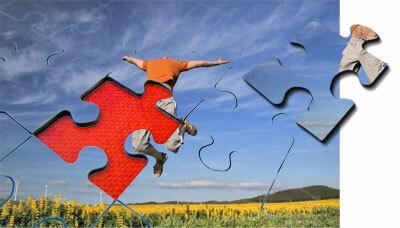 Today's increasing pace of life is demanding more energy, motivation and commitment to live a productive life. Many are finding that work is consuming all their energy and they feel drained by the end of the day. Throughout the centuries the wise people knew how to look after themselves with the right potent food, fresh water, fresh air, sunlight, rest and herbs. They didn't need processed supplements (that cost the earth, and they didn't have anywhere the amount of disease we have today. Today 1 in 2 people are expected to develop cancer sometime in their life, what is the chance of our future generations surviving on the toxic, preservative and additive-laiden foods that are the norm today. Many people live pressured lives with low energy, depression and increasing illnesses. All of these can be turned around quickly by making some simple changes and addressing common nutritional needs, eating health-giving food along with detoxing herbs that eliminate toxic buildup. 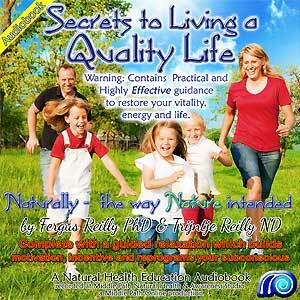 Secrets to Living a Quality Life is a comprehensive compilation based on many years of Naturopathic clinical practice and research into restoring vitality, building robust good health, energy and motivation. It teaches you what you can do - inexpensively and without negative side-effects - to restore your love of life and living. The information in Secrets to Living a Quality Life will also save you hundreds of dollars in health care costs by showing alternative sources of nutritional supplements (what we call “power foods”)and how to use them. Incorporating just a few simple changes in your daily life will add more enjoyable years to your life span, eradicate depression and mood swings, greatly increase your natural resistance to all disease and restore your zest for living life to the full. 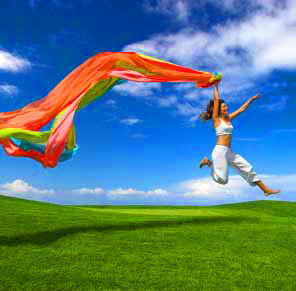 It is up to YOU to make the change so you can live a vibrant life full of energy, disease-free and happy. Middle Path Health and Awarness has developed “Secrets to Living a Quality Life” which WILL give you simple solutions to make a HUGE change in your life and your family's. 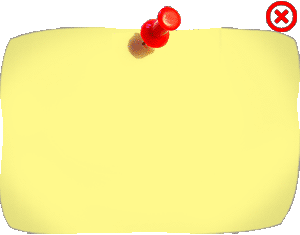 Nowhere else will you get complete information all in the one package. Using the information in “Secrets To Living a Quality Life” WILL transform your life without costing you the earth. SO if you feel your life and living could be improved or more enjoyable then get your preferred version of “Secrets To Living a Quality Life” and take your first step on the path to a happy, healthy, vibrant life. The key ingredient to becoming energetic is a supportive attitude - without this you will simply not be motivated to succeed. Secrets to Living a Quality Life contains a unique and powerful guided relaxation track to create the shift in attitude which will motivate you to become healthy, energized and vital. There are also several simple, powerful and effective techniques to help you deal with any emotional or mental stress which may accompany losing weight. Frequently it is these pressures - and not knowing how to cope with them - that cause many people to give up before achieving their goals. What you can do to eliminate fatigue. A technique to keep your emotions balanced. The significance of water and its influence on your health. An alternative to cows milk that will make you supple and agile. Age-old wisdoms which rejuvenate and boost your whole system. Power foods to heal, restore and add powerful energy to your body. Wild herbs (weeds) which contain vital nutrients missing from supermarket foods. Having successfully treated many individuals for chronic fatigue and lack of motivation over many years I know there is a desperate need for education on how to maintain natural vitality. Many cases of fatigue begin in the mind - attitudes, fears, beliefs, guilt and phobias can all contribute to energy depletion which will not respond to stimulants alone. Fatigue (chronic or otherwise) is not a difficult thing to deal with, however there are some basic treatments which are common to every depleted condition. I have condensed what I have learnt about balancing the body, mind and spirit to achieve a healthy result. I found this information was the missing link that helped so many of my clients change their lives permanently and positively. This CD takes the whole person into consideration - a wholistic approach - and encourages healthy attitudes, emotions and beliefs. Many of my clients have become energetic, fatigue-free, happy and healthy using the information in Secrets to Living a Quality Life. A welcome message and introduction to the CD and vital living. How to get the most out of your Secrets to Living a Quality Life CD. Positive changes you will experience by Secrets to Living a Quality Life. How your emotions and moods can contribute to lifelessness and loss of vitality and what you can do about this. Tried and true natural remedies that will help you regain and retain your vitality. How to obtain top-quality, untampered-with, health-preserving nutrition the way nature intended! How to obtain top-quality, relatively untampered-with, health-preserving nutrition from your local food store or supermarket! "You are what you eat" - an effective life time eating regime that will boost your health and make you vital and alive. The importance of activity and what you need to create a feeling of being alive. An explanation on how relaxation and subconscious programming works and the effects it will have on you. 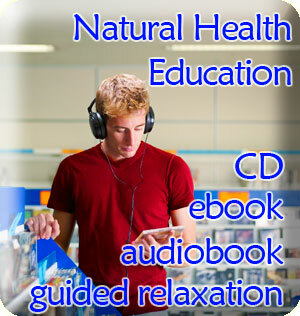 The key to the CD - intended for daily use, this guided relaxation track helps to retrain your mind and will help you become relaxed and change your subconscious patterns which have previously discouraged vitality and aliveness.